Cinema Beef Podcast: Dope, Guns and Nosy Neighbors Make Max a Dull Boy! Dope, Guns and Nosy Neighbors Make Max a Dull Boy! 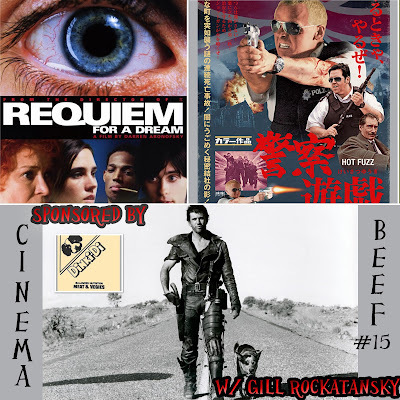 It's another international incident when I chat in great length with Gill Rockatansky of Gill and Roscoe's Bodacious Horror Podcast! We talk about many things including hot tub etiquette, Bob Dylan and oh yeah we talk about films as well. On this edition, we open with the drug-laced bowl of drearios known as Requiem for a Dream from 2000. Next, we go blasting through the UK with pens and guns blazing when we discuss Hot Fuzz from 2007. Finally, we become warriors of the wasteland when we get to laugh and pillage about The Road Warrior A.K.A. Mad Max 2! So, find your dealer, never trust your local government and always fill up on gas! Email me with feedback, complaints, cash donations, sexual favors or suggestions or to even be on the show. Like Gill and Roscoe's Bodacious Horror Podcast on Facebook! Get all of their past episodes on the Horrorphilia feed! "The World Need's Guts" performed by Alice Cooper from the album "Constrictor"
"The No No Song" Performed by Ringo Starr from the album "Goodnight Vienna"
"Black Sunshine" Performed by White Zombie from the album "El Sexorcisto"
You can get my show, Gill's show and tons of others on the Horrorphilia Network of Podcasting! Show us some love on iTunes and Stitcher!